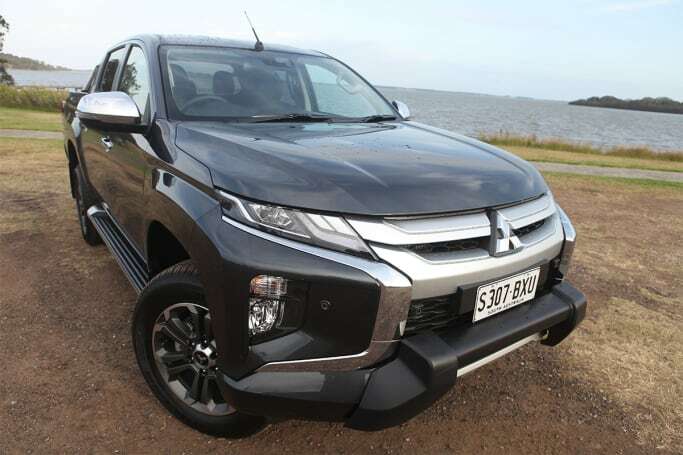 Of the Aussie market’s quiet-achieving utes, in terms of sales, there are several, but few of those are as value- or feature-packed as the Mitsubishi Triton. Never truly spectacular in the past but always rather steadfast and reliable, the Triton has now had a substantial ‘reimagining’ with substantial exterior changes and extra safety tech, but with that comes more weight, extra body, increased fuel consumption and a higher asking price. Is it worth that extra cash? Read on. We tested the new GLS Premium trim which has replaced the Exceed as the Triton line-up’s top-shelf model. 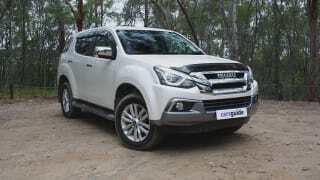 It is available only as a dual-cab 4x4 in pick-up body style with an automatic transmission and costs $51,990 – a $3000 increase over the Exceed’s price, but the GLS Premium does come packed with standard features, a heap of accessories and is currently being advertised on the Mitsubishi Australia website as $50,990 drive-away. Over and above the GLS’s standard gear – including chrome grille, HID headlights, LED daytime running lights, chrome exterior handles, leather steering wheel and shifter knob, six-speaker audio system, power folding door mirrors, chrome sports bar and 18-inch wheels – the Premium gets push-button start, nudge bar, leather-look door trim inserts, heated front seats, electric driver-seat adjustment, leather seats, paddle shifters, a surround-view camera system and rear diff lock. It gets a stack of safety tech including forward collision mitigation (which incorporates AEB), lane-departure warning, blind-spot monitoring, rear-cross-traffic alert, lane-change assist, front and rear parking sensors, reversing camera, stability control, seven airbags, as well as auto headlights and wipers, and hill descent control. Our tester had a nudge bar and substantial easy-to-use side steps. The Triton has the range’s 2.4-litre four-cylinder turbo-diesel engine, which produces 133kW@3500rpm and 430Nm@2500rpm. A six-speed automatic transmission has replaced the previous model’s five-speed auto. 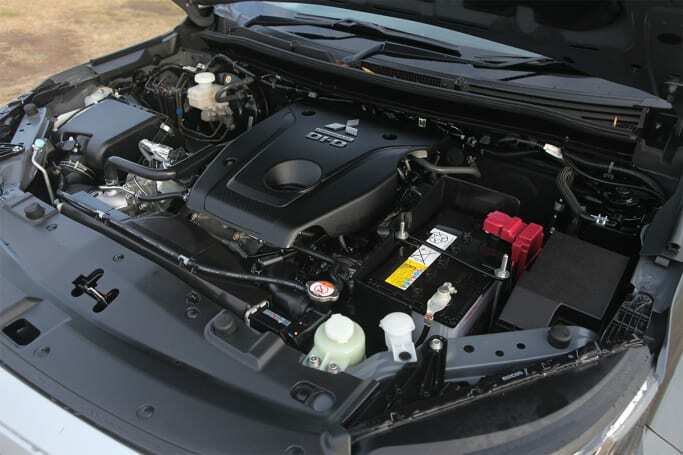 The 2.4-litre turbo-diesel engine is a lively unit. The GLS Premium has Mitsubishi’s Super Select II 4x4 system with new drive modes, and centre and rear diff lock. The buzz phrase around the arrival of the new Triton line-up has overwhelmingly been ‘Dynamic Shield’: that’s the moniker given to the new model’s starship-sized front end. It’s certainly eye-catching and quite a few car journos are rather fond of it but, in my experience with it so far, the nose has drawn as many jeers as it has cheers. I didn’t mind the look of the previous-gen Triton, but I’m getting used to ‘Dynamic Shield’. 'Dynamic Shield' is the name given to the Triton's new front end. As part of the redesign, the back end has been squared off a bit more than in previous versions. The rest of it is the pretty standard general appearance of a contemporary ute: easy on the eyes with body scoops, flared wheel-arches, and an overall solid tough-looking presence about it. The cabin’s interior retains the look and feel of a top-shelf Triton but with an even more plush atmosphere about it. 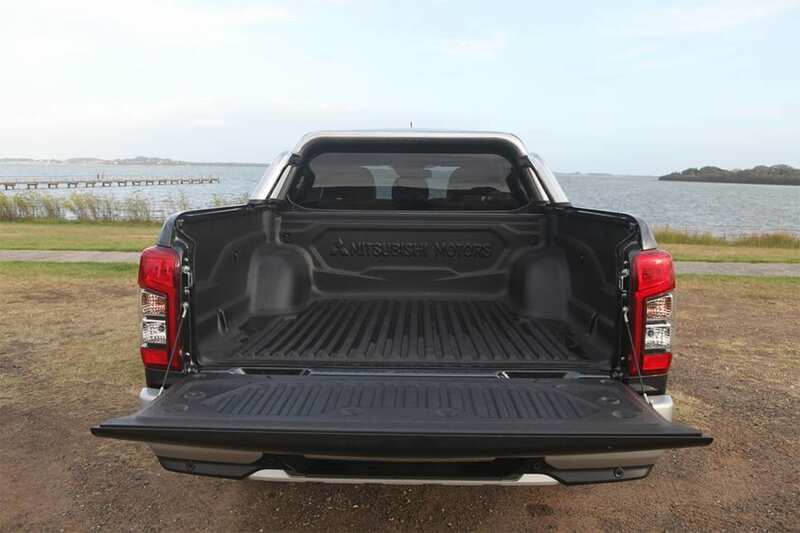 Leather seats (heated at the front), leather steering wheel and shifter knob, as well as soft-touch surfaces and padding in areas where it’s handy to have it, especially when touring off-road – in door trims etc – help to put the premium in this Premium ute. The interior has a real plush feel about it. 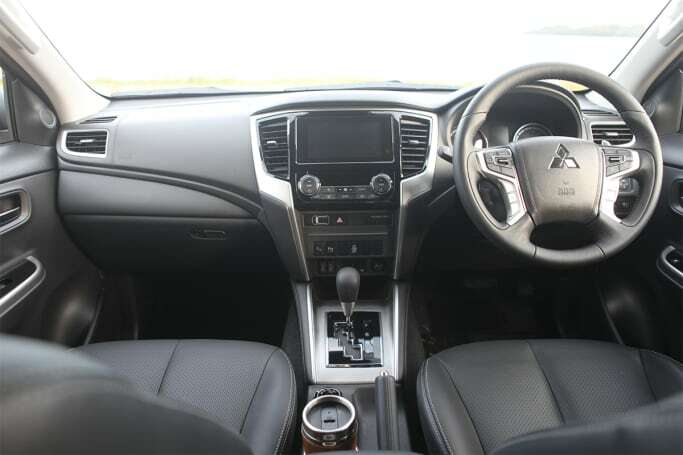 This top-spec model gets Mitsubishi’s 7.0-inch touchscreen media system (with Apple CarPlay and Android Auto), digital radio, Bluetooth connectivity and more. Don’t go looking for sat nav, as we did, because it’s still not here. Storage spaces include glovebox, two cupholders up front, centre console with storage box and lid, moulded door pockets with bottle holders. For back-seat passengers, there are seat-back pockets, bottle holders in the doors and a fold-down centre arm-rest replete with two cup-holders. There are two USB ports up front and two for those in the back seat. Even though this new Triton is longer (up from 5280mm to 5409mm) and taller (1780mm to 1795mm) than before, the general feeling of room inside is still a bit squeezier than other utes – no deal-breaker but noticeable. Seats are snug and supportive all-round, although a tall mate of mine complained about what he reckons are short driver and front-passenger seat-bases. The back-seat bench is a more comfortable proposition for two people than three. 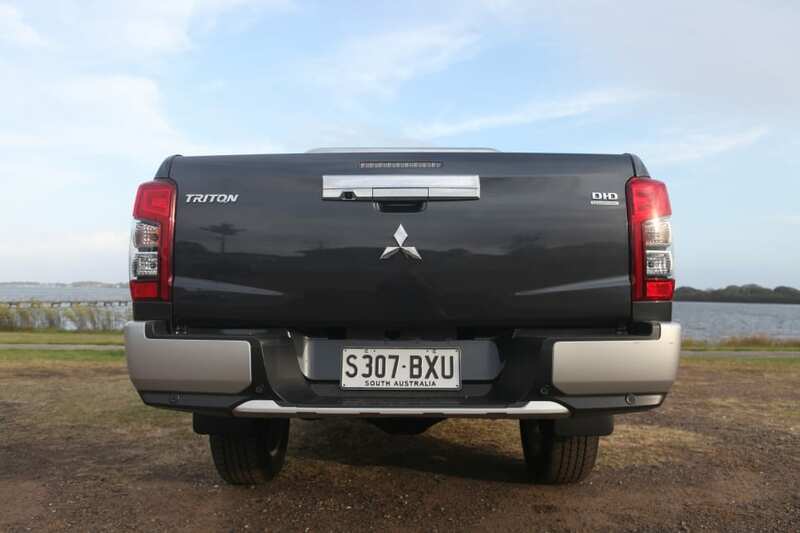 The Triton is a lively day-to-day ute to drive, but it has been for quite some time. The GLS Premium is listed as 5409mm long (with a 3000mm wheelbase, same as before), 1815mm wide, 1795mm high, and has a kerb mass of 2042kg. It has an 11.8m turning circle. The Triton is bigger than the previous model, but remains very nimble on city and suburban streets. Because the Triton isn’t the biggest ute around, getting in and out still requires a bit of sideways yoga – no problem for me because I’m as agile as a jungle cat – but grab handles aid ingress and egress. 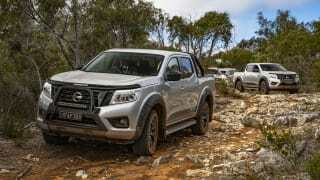 So, it’s longer, taller and a little heavier than before, but it’s still very nimble on city and suburban streets, as well as on country back roads and bush tracks, especially compared to most of its dual-cab ute rivals. Steering, tilt and telescopic adjustable, is mostly well weighted but takes on some heft at lower speeds. The Triton’s 2.4-litre engine is a gutsy number and is well matched to the new six-speed auto. Changing up or down in manual shift mode is preferable to relying on the transmission to work through in drive mode as, in drive, there is a marked delay between foot-down and vehicle response. The Premium’s paddle shifters help your cause. The image from the surround-view camera is clear. 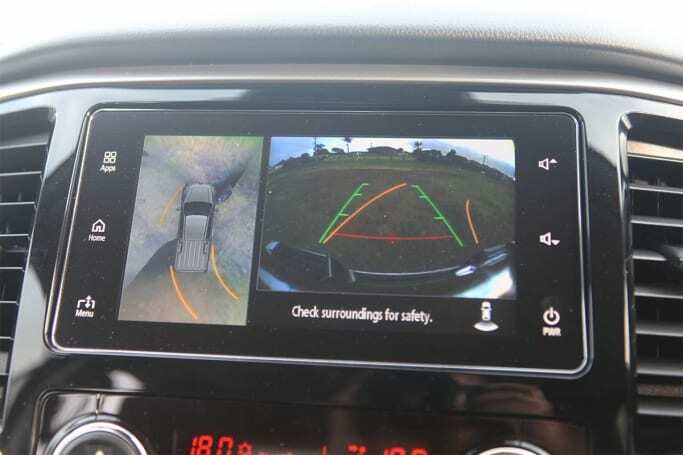 The All in All-round visibility has disappeared, but the reversing camera and surround-view camera system offset any negatives from those pinched glass sections. That ‘multi around monitor’ (the surround-view camera) deserves a special mention here as its depiction on the multi-media screen is clear and easy to see. The GLS Premium’s suspension set-up includes double wishbone, coil springs and stabiliser bar at the front and leaf springs at the rear. 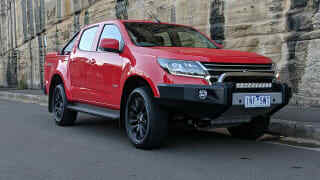 It drives on 18-inch Bridgestone Dueler H/T tyres (265/60R18). The Triton has newly tweaked blacktop-friendly five-leaf-spring suspension but unladen ride and handling are still pretty ordinary: there’s some skipping and thumping through more pronounced surface irregularities and its 18-inch wheels don’t tend to help the comfort cause. The Triton’s ground clearance and departure angle have always been issues for this otherwise very capable off-roader. 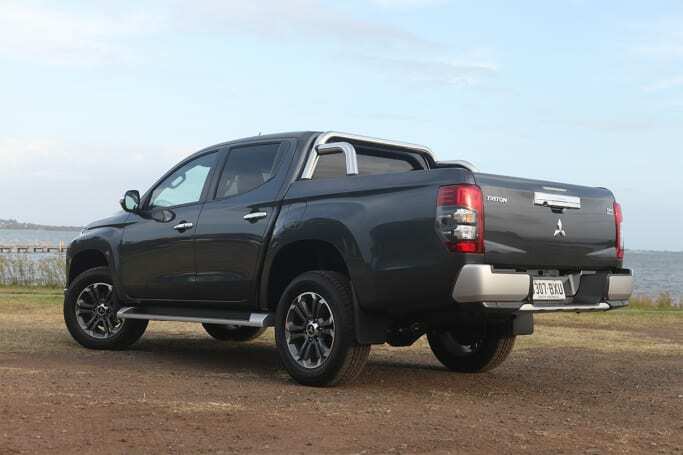 Well, the Triton’s departure angle at 23 degrees remains pretty ordinary – it can’t be helped because so much of the tray hangs to the back of the rear axle – but Mitsubishi has gone some of the way to addressing the ute’s ground-clearance fail; it has been increased by 15mm to 220mm. However, wading depth is a less-than-fantastic 500mm. Approach and ramp-over angles are 27.5 and 25 degrees respectively, and the Premium’s side steps have been raised 20mm higher than those on the Exceed, further helping drivers to work the angles when 4WDing. The GLS Premium gets Mitsubishi’s Super Select II system which offers four modes: 2H (two-wheel drive, rear), 4H (4X4 but in an all-wheel drive mode, safe to use at high speed on bitumen), 4H LC (4X4/all-wheel drive with locked centre diff; off-road driving at 30km/h or so) and 4L LC (4X4/all-wheel drive with locked centre diff and crawler gears engaged; only for low-speed 4WDing (below 30km/h). It’s a solid system – with selectable off-road modes (snow/mud, gravel, sand, and rock – and works supremely well. This Triton was never thrown off its 4WD game during test although we never truly tested its wading depth. There are grab handles all round for when things get bumpy while 4WDing. 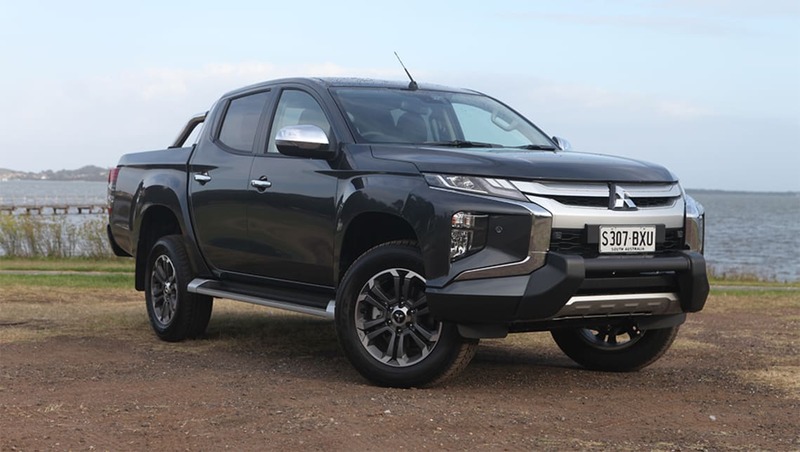 Put a bush-suited wheel-and-tyre combination (16-inch all terrains) on it, as well as factor in a suspension lift and this ute will be even better off-road. A lot of the Triton's load space is behind the rear axle. The Triton’s tray is 1520mm long, 1470mm wide and 475mm deep. The Triton’s tray is 1520mm long, 1470mm wide (1085mm between the wheel arches) and 475mm deep but keep in mind when throwing tools or camping gear in the tray that a chunk of its load space is behind the rear axle. Load height is 865mm off the ground. The Triton has never been a hauler of huge loads and nothing has changed in that respect; payload capacity is 858kg. Maximum towing capacity is 3100kg (braked) and 750kg (unbraked). The GLS Premium has a GVM of 2900kg and a GCM of 5885kg. The auto’s claimed fuel consumption (combined) has increased from the previous gen’s 7.6L to 8.6L/100km. We recorded 8.61L/100km after almost 400km of driving, including about 10km of off-roading, some of that in low-range. It has a 75-litre tank. All Triton variants have had a five-star ANCAP rating since April 2015. The GLS Premium has driver and front-passenger front and side airbags, driver’s knee airbag and full-length side curtain airbags. There are two ISOFIX and two top tether child-restraint anchor points in the rear seat. Its suite of safety tech is impressive and includes forward collision mitigation system (incorporating AEB), lane-departure warning, blind-spot warning, lane-change assist, rear cross traffic alert (RCTA). All new Tritons have a seven-year/150,000km warranty if bought before June 30, 2019; for Tritons purchased after that date, a five-year/100,000km warranty will apply. Capped-price servicing is valid over three years and is recommended at 12 months/15,000km. It’s still one of the best value-for-money 4WD dual-cab utes on the market and the Triton is also now one of the best equipped dual-cab utes on the market in terms of safety tech. It’s nicely designed, well built, easy to drive, as well as lots of fun off-road because you can put your trust in the mechanicals. Its Super Select II is one of the best 4WD systems around. The GLS Premium manages to take all of the elements that were so impressive about the Exceed and dial them all up a notch. It’s a nice blend of good looks, up-market polish and get-dirty grunt. The Holden Colorado LSX might look like a rough and rugged off-road beast, but is it tough enough to handle family duties in the city? We put one to the test to find out. There was once an ad on telly where the guy asked, 'got any blacker?' It seems that was a premonition, with seemingly dozens of black edition vehicles available in recent times. This Nissan Navara ST Black Edition is the second such example of the ute - but now it's cheaper.